The Aga range cooker look with fuel savings. A Thornhill Complete Control oven & burner, but with your old oil fired Aga range cooker front panel, lids & doors. 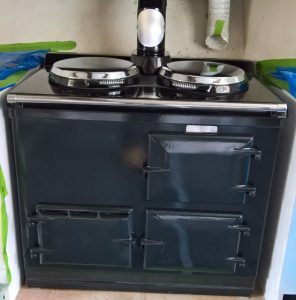 If you love the look of Aga range cookers but don’t want to pay the fuel bills that Aga range cookers incur, and you have an existing Aga range cooker that is costing you a lot of money to run, we can take your Aga outer shell (just the doors, front panel and lids) and encase it around one of our Complete Control Thornhill range cookers. Our expert engineers and technicians have years of experience in working with Aga range cookers and can easily fit any of our Thornhill range cookers into an Aga range cooker exterior with no compromise on quality and all the benefits of lower running costs. Because of the huge cost of testing and certification we can only make oil cookers at the moment. With this oil cooker you can have a balanced flue, which is not possible with a conventional oil fired AGA Range cooker’. Re-Engineered Oil ‘AGA range cooker’, 2 oven, balanced flue, part exchange: £ 6,150.00 Inc VAT.